There are over 4,800 free themes available in the official WordPress themes directory alone. And thousands upon thousands more are available through third-party marketplaces. Finding a properly functioning theme with clean code in this jungle of WordPress themes is no easy task. No matter what type of WordPress website you’re building you should never randomly pick a theme for your website. Because there are several key features that you need to be aware of before you start your search for a theme. The features you need to look for a theme often differs depending on the type of website you have. Especially if you’re making a photography website, you need to find a theme that comes with special features that fit in well with your industry. In this article, I share a few personal tips and hacks that’ll help you find the perfect theme for your photography website. The popular saying “a picture is worth a thousand words” applies more to photography websites than any other type of website. Photography is all about expressing emotions, events, and beauty with a single picture instead of using words. And your photography website should help highlight that. Having a minimalist website design that highlights your photos will not only help showcase your photos more effectively but it will also give your website an attractive modern look. 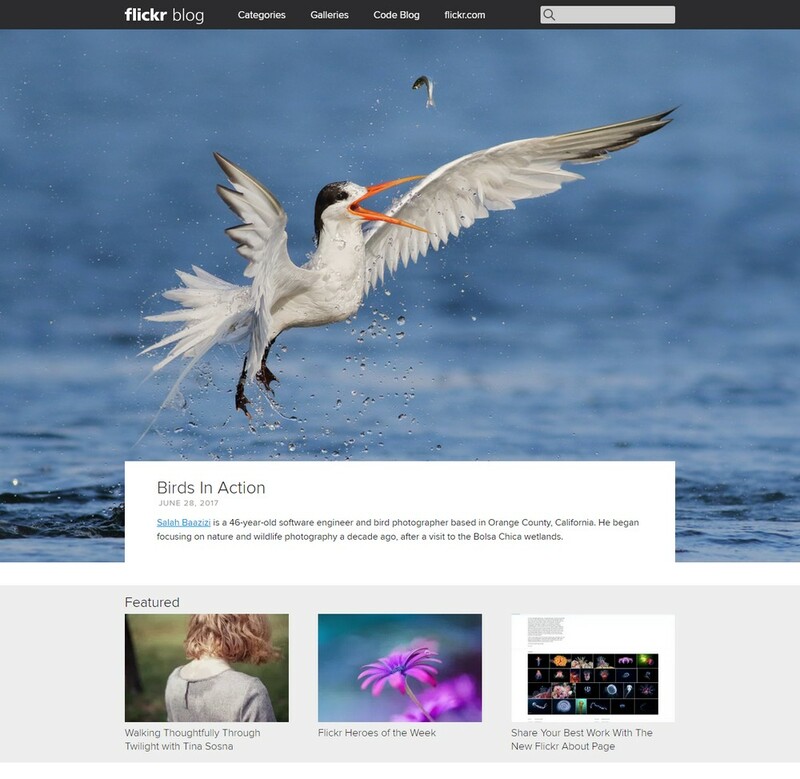 Like the Flickr Blog, which, in fact, also uses WordPress to power the website. Notice how the blog layout uses large image thumbnails to attract the user attention. Look for a photography theme that supports a minimal homepage design and have more space for showcasing photos and videos. You’ll be adding a lot of photo galleries and image slideshows all over your website. If you take a look at any other photography website, you’ll see galleries and sliders being used on the homepages, portfolios, and even blog posts. A professionally designed photography theme will include galleries and sliders with advanced features such as timers, transition effects, and autoplay slideshows. If you find the right theme, you’ll find these features much useful. Of course, you can always use third-party plugins to add galleries and slideshows as well. But, finding a theme that already comes with these features built-in will help you save the extra costs. Most bloggers often confuse portfolios with galleries. An image gallery and a portfolio are two different things. While an image gallery simply showcases a collection of photos, the job of a portfolio is to showcase your work. A great portfolio page will allow you to not only feature your photos and photoshoots but also include detailed descriptions for each job you’ve done in the past. This helps your visitors and potential customers learn more about your skills and how you work. Most premium Photography WordPress themes come with multiple portfolio layouts to let you choose a portfolio page that best fits your style of work. Keep an eye out for portfolio layouts when you’re searching for the perfect theme. James Brandon, a professional photographer, has a shop in his WordPress website to sell his eBooks, Lightroom presets, and online courses. It’s a brilliant way to monetize a photography website. You could also create unique Lightroom presets, an online course, or even sell your photos directly from your website as well. The best part is you don’t need to hire a web developer to setup a shop on your website. You can create one by yourself. Just remember to buy a WordPress theme that supports eCommerce plugins such as WooCommerce and Easy Digital Downloads. Most themes are compatible with these plugins but check with your theme developer before buying just to make sure. How will your website visitors and customers know if you’re available for work? How can they learn about what kind of work you do? Or if you’re attending any local photography events this year? Setting up services and events pages on your photography website will allow you to help your customers and fans learn more about the work you do, what your upcoming schedule looks like, and what type of work they can hire you for. Your WordPress theme should include services and events page layouts with a clean layout for clearly describing your services. Not all WordPress themes are perfect. Some are poorly coded by amateurs and only a few can be accepted as the best themes. Most of those gorgeous looking themes are also often the most terribly performing themes. Because a WordPress theme is about more than just the looks. How fast your website loads and how it looks on mobile devices now matters more than ever. Google uses the speed of your website as a ranking factor when including your website in its search results. The faster your website loads, higher it will rank in Google search results. So, it’s crucial that you find a theme that performs fast and has a responsive design that looks great on all types of devices and platforms. There are a few tools you can use to determine how fast your theme loads and determine its responsiveness. Use Pingdom Speed Test to test the speed of your website. And use Google Mobile-Friendly Test to find out if the theme is mobile-friendly. How do you run these tests before buying the theme? Simply copy the URL of your theme’s live demo page and paste it into the tools to run the tests. It’s as easy as that. Now that you know what to consider when looking for a new WordPress theme for your photography website, I have some resources to recommend. One of the most popular and successful theme developers are the people behind Flothemes, a WordPress theme shop by photographers for photographers. Thousands of full-time professional photographers trust their themes and their support, so check them out. You can also find a curated list of premium and free Photography WordPress themes here. And finally, if you are looking for some unique design resources for designing a photographer’s website, browse through WordPress for Photographers. Finding a great WordPress theme for your photography website is not that difficult once you know what to look for in the theme and how to test the theme for effectiveness. In addition, remember to buy your themes from reputable marketplaces that put quality over quantity. Check for theme support and how often it has been updated. And remember: you get what you pay for. Free themes are good when you are only starting out and getting used to WordPress, but you will want to upgrade to a premium theme as soon as possible. Soooo, a whole lotta jibber jabber with no specific examples????? I’m looking for good WordPress theme for a photographer. A few suggestions would have been greatly appreciated. The purpose of the article was to mention some criteria by which to choose a theme. But true, a continuation with some examples should be written.